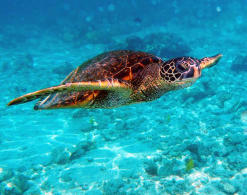 The green sea turtle will find a haven in the Primeiras and Segundas marine protected area. 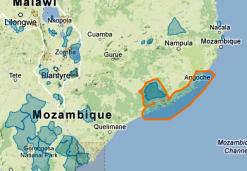 The location of Primeiras and Segundas on Mozambique’s northern coast. Local fishermen in Primeiras and Segundas. Mozambique’s pristine Primeiras and Segundas coastal belt is now formally under conservation, thanks to the recent proclamation of Africa’s biggest marine protected area (MPA). Known as the Primeiras and Segundas archipelagos, the MPA covers almost 10 500 square kilometres – about one and a half million hectares. It’s the second major conservation area in the country to be declared within the last two years, after the creation of the Lake Niassa reserve in mid-2011. 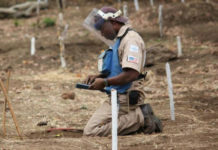 The proclamation came as a result of eight years’ work by the World Wide Fund for Nature’s (WWF) Mozambique chapter together with humanitarian agency Co-operative for Assistance and Relief Everywhere (Care), academia and the country’s government. This vast area, located in the north of the country between the Nampula and Zambézia provinces, encompasses ten islands – five for Primeiras and five for Segundas – as well as mangrove forests that contain eight species, vibrant coral reefs, shrimp, fish and seabird breeding sites and seagrass ecosystems. It’s a nesting ground for sooty terns and the vulnerable dugong, and is home to five of the world’s seven marine turtle species, as well as the mysterious coelacanth. This makes it ecologically sensitive and significant. 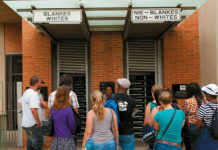 But in recent years fish stocks have dropped because of exploitation by local communities as well as commercial ventures, and unauthorised tourism was also taking its toll. Time was running out for Primeiras and Segundas, until conservation authorities stepped in to educate the community about protecting this precious natural resource. Thanks to fishing associations formed within communities and driven by WWF and Care, locals now understand the importance of securing their food supply and income, as well as those of generations to come. The formation of associations has also, in some cases, facilitated access to finance, which in turn has helped to start up small enterprises such as a ferry between the islands and the nearby coastal city of Angoche. One fishing association is helping its women to become more literate so that they can play a bigger role in the new set-up. 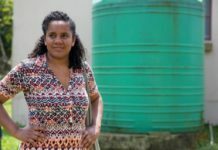 Through education, by creating no-fish zones, by facilitating greater access to markets for fishing associations, and by introducing sustainable agriculture and mariculture techniques, the Primeiras and Segundas Sustainable Livelihood project has brought this natural trove back from the brink. For instance, communities have been encouraged to return accidentally captured adult turtles to the sea and to stop eating turtle eggs and meat. He said that the organisation was excited about the fact that the area was saved because of collaboration between citizens, NGOs, academia and government, which is reportedly still drafting management plan for the new MPA. According to WWF, Primeiras and Segundas contains the most abundant, diverse and robust hard and soft coral community in the country. Other marine treasures include its underwater caverns, colourful marine life, and mangrove and seagrass plant life. Coral reefs around the world – including Australia’s iconic Great Barrier Reef – have come under threat from bleaching, a phenomenon that occurs when coral expel the symbiotic unicellular algae, known as zooxanthellae, that live in their tissues. This turns the coral white. It’s caused by a number of factors that include changes in salinity, bacterial infections or exposure to air, but most commonly because of changes in water temperature. However, apart from an incident in 2009, the coral in Primeiras and Segundas have escaped this threat because of cold water that wells up from the sea floor. 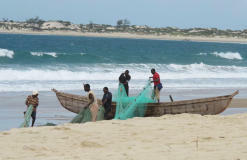 “The proclamation is a significant contribution by Mozambique to safeguarding the future of the world’s marine environment more generally,” said John Tanzer, director of WWF’s Global Marine programme.